Sometimes the light is "just right" and a fleeting but glorious event happens which can easily be missed as we carry on with our busy day. In Morning Roundup, I tried to capture the glory of one of those exciting “sunlight moments” that stir our emotions with wonder and then let that light bathe over one of the most exciting and beautiful events one could witness. While standing gazing at the sun, a distant thunder gradually increases and a cloud of dust rises. 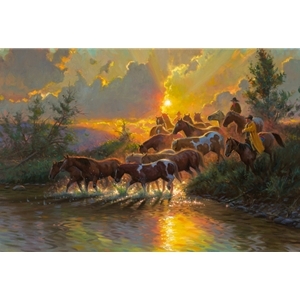 The anticipation of what is coming heightens the senses, and then, like ghosts from the past, these wranglers come up to the edge of the river bank, pushing their new horses to cross over to their new home. These three men are missing out on the drama of light that is behind them, but I have put it all together for you to enjoy and for the delight of your senses in Morning Roundup.